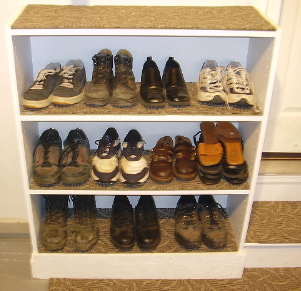 Coming up with a shoe storage idea doesn't have to be as difficult or expensive as some people make it. The simple fact is, most homes have insufficient closet space for all the boots and shoes that need it. Knowing this, plenty of manufacturers have created all kinds of good shoe storage solutions. Things like racks that hang on the backs of doors, and layered racks that stay on floors are some of the more common ones. The solution that's right for you depends on your own situation, but keep in mind that any type of shoe storage organizer will at least help manage some clutter, and that in itself is always a good thing. This shoe storage organizer is made from an old beat-up bookcase that was destined for the trash. With a few screws here and there to add more stability, it makes a perfect garage shoe storage solution. The bookcase is fastened to the garage wall studs and painted white. It has cut carpet tiles on the shelves which add a nice touch. In addition, plywood was cut and used for the molding along the base, then painted white as well. Make sure you don't anchor the bookcase where it will be in the way of anything like getting around in your garage, or parking your vehicles. Putting it close to the door that leads to the house makes it even more convenient and easy to use. In this example, carpet tiles lead to it from the door, so it's friendly for socks or bare feet. This particular bookcase has pre-drilled holes for adding more brackets and shelves, so with time, it can hold even more shoes and boots. Sure, it's a simple shoe storage solution, but it adds some garage functionality and storage convenience, while freeing up closet space inside your home. If you see life through a frugal eye, an old beat-up bookcase from a garage sale might just be the best shoe storage for you.